On the second day of the $2 a day challenge, I was better prepared. I had cooked more food and had it with me at work. It was a much easier day. I was reflecting in the morning on how I strangely did not feel nearly as hungry as day 1. Perhaps it was because I had more food, but even so, I was still snacking on my porridge breakfast at 1130am. I was discussing this phenomena with a friend, who helpfully suggested I was in fasting mode. He had experience from his annual Ramadan fasting. Seeing how hungry and grumpy I was on day 1, it is hard to believe what it would be like to have no food at all during the day. Breakfast was 2/3 cup of porridge. I gave myself extra this time, to help fuel myself through the day. Lunch was half of a caramelized onion tart. I had high-hopes for the tart. It would have tasted better with cheese to help offset the sweetness of the onion, but still it was not too bad. A colleague was subtly querying me at lunchtime if I was ‘still on the $2/day challenge’. He thought I had just ducked down to the cafe for a quick fix. 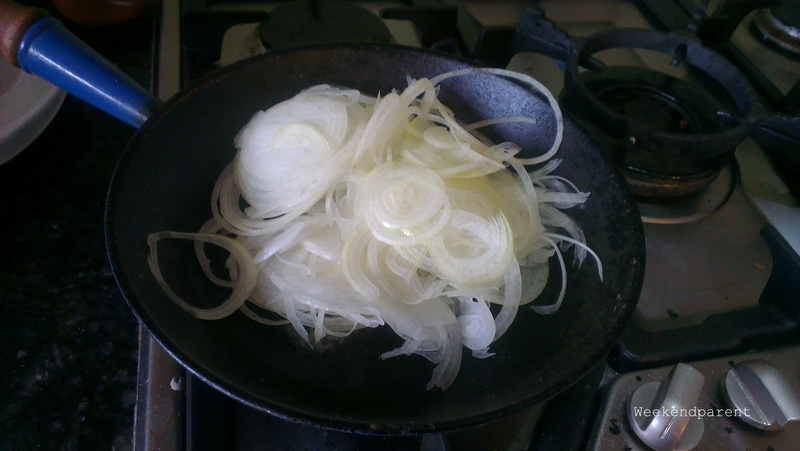 Gently fry the onion with butter over a low heat for around 30 minutes or until caramelzied. After 10 to 15 minutes you can add a little sugar to help the caramelization process. Set aside to cool. Rub the butter into the flour and oats until it begins to resemble fine bread crumbs. Add the water and mix to combine. Roll into a ball, cover with clingwrap and rest in the fridge for at least 30 minutes (I made mine the night before). 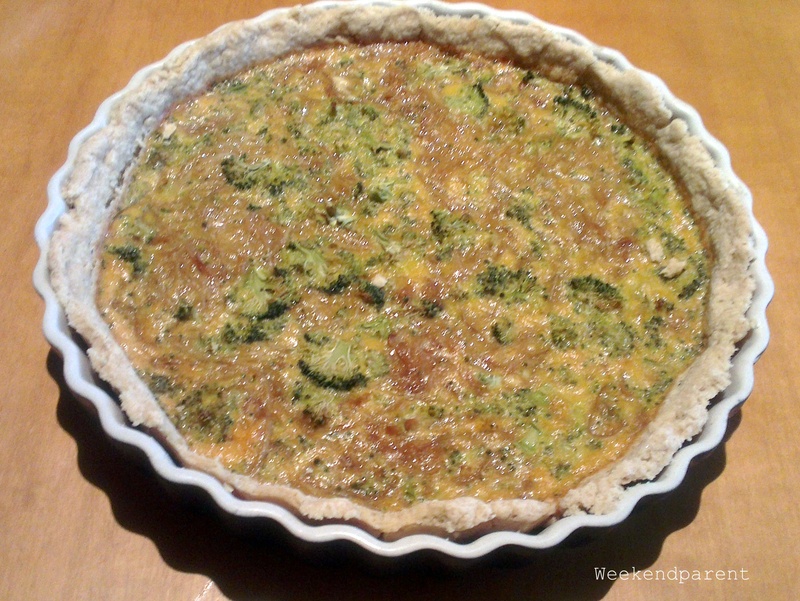 Roll out the pastry and use it to line a Quiche or pie plate. It doesn’t need to be perfect – the filling hides all sorts of imperfections. Beat the eggs, and add a few tablespoons of water and the French onion soup. Strain the mixture through a fine sieve. Pour the egg mixture over the caramelized onions and broccoli. Stir until combined, then pour over the short crust base. Bake in a moderate oven, around 160C for 30 minutes or until set. 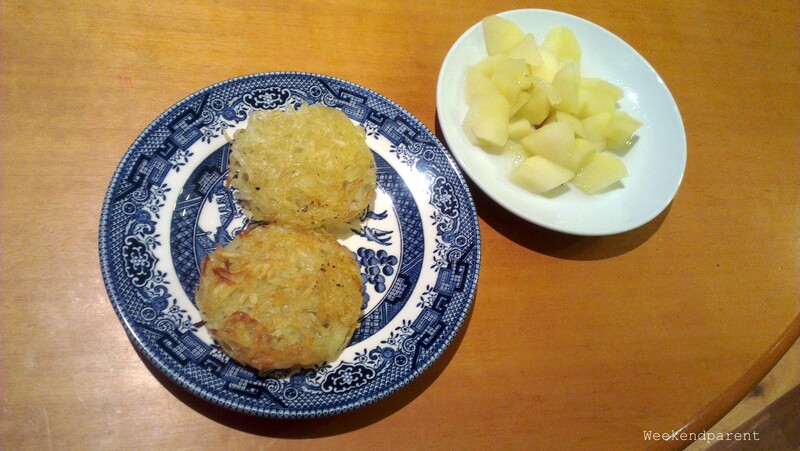 Dinner was a simple meal of potato rosti with apple sauce. I used to love potato rosti as a kid. My Nana used to make it for us. She called it ‘mock fish’, I guess it must have been a depression era staple. I had no idea it was thrifty – I just liked it a lot. There was actually a third rosti, but it kind of disappeared while I was cooking it. I like these potato rosti so much. Can’t believe it has been years since I ate them. After dinner I relaxed with a cup of tea, made from leftover apple peel and a bit of sugar. While I am craving real tea a bit, it actually tasted quite nice. Not luxurious, but good. So, day two is a wrap. Now towards day 3.